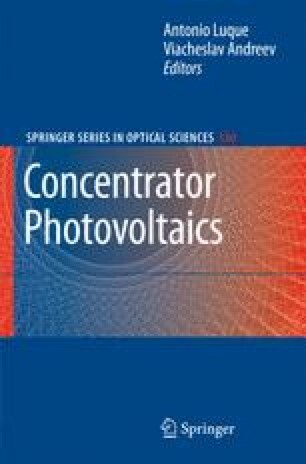 Most PV concentrators use only direct solar radiation, and they must therefore permanently track the sun’s apparent daytime motion, and hence integrate an automatic sun tracking structure able to mount and position the concentrator optics in such a way that direct sunlight is always focused on the cells. This sun tracker is basically composed of a structure presenting a sunlight collecting surface in which to attach concentrator modules or systems, which is somehow coupled to a one- or two-axis mechanical drive, and also of some sun tracking control system which operates over the drive axes and maintains an optimum aiming of the collecting surface or aperture towards the sun. Static mounts are only feasible presently for low concentration factors (below 5×); however, in the long term, static concentrators with higher ratios may appear, making use of luminescence and photonic crystals; however, all these issues are beyond the scope of this chapter. Line focus reflective concentrators, such as troughs, only require one-axis tracking to maintain the PV receiver along the focus line; however, due to the daily variations in the sun elevation, sunlight incidence on the tracker’s aperture is usually somewhat oblique, thus reducing the intercepted energy and causing the sun’s image to move up and down within the focus axis, and producing further losses whenever it surpasses the receiver’s ends.